Art and Performance by Veterans, July 31 – August 3. Free admission. You are invited to participate in a series of events Celebrating The Art Of Service and promoting community integration through creativity. The events are designed to foster a collaborative network of relationships between Veterans and the greater San Francisco community. The general public has also been invited to join Veterans and participate in a series of art and performance experiences highlighting the value of continued service, collaboration and knowledge-sharing in the vibrant San Francisco Bay Area community. All events are free at the Mission Cultural Center. Car escorts will be available. 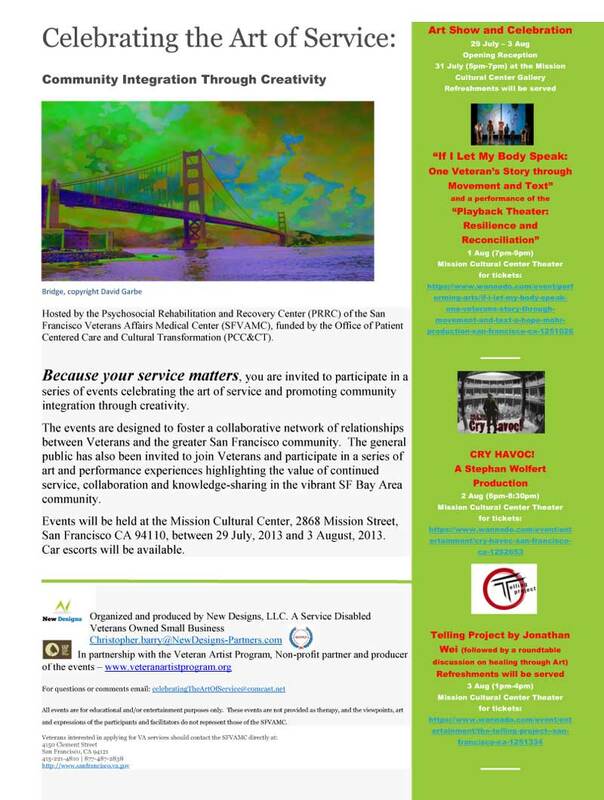 Hosted by the Psychosocial Rehabilitation and Recovery Center (PRRC) of the San Francisco Veterans Affairs Medical Center (SFVAMC), funded by the Office of Patient Centered Care and Cultural Transformation (PCC&CT). All events are for educational and/or entertainment purposes only. These events are not provided as therapy, and the viewpoints, art and expressions of the participants and facilitators do not represent those of the SFVAMC. Categories: Art, Events, Performances, Projects | Tags: Because Your Service Matters, Celebrating The Art Of Service, Chris Barry, Cry Havoc, Disabled Veterans, Jonathan Wei, Let My Body Speak, Mission Cultural Center, New Designs-Partners, Playback Theater, Resilience and Reconciliation, San Francisco, Stephan Wolfert, Telling Project, Veteran Artist Program, Veterans Community Media Center, Veterans Media Center of San Francisco, vmcsf.org | Permalink.